Being a new member I'm not quite sure anybody has posted about this, if anybody has I don't want to steal their thunder, regardless here we go. as 3DS. Geno's reports have been pretty good considering he correctly predicted the Castlevania and Kingdom Hearts HD collections a bit ago. One of these titles he recently established was "Donkey Kong Land Returns" for 3DS. Though we have no proof of any of this, it's alot to get excited about. include a new Metroid (possibly "Prime 4"), Zelda 3DS and the 3D Mario we've been waiting for on Wii U.
I take no credit in any of the info given or discovered, I just wanted this info to be spread to all the Donkey Kong fans out there, since I was utterly excited to find this bit of news. Re: A New Donkey Kong Land? There was an image of DK holding a 3DS or something similar on the Retro site at launch day a long time ago, wasn't there? Thanks for the heads-up, TWC — I hadn't heard anything of this yet. Nintendo 3DS Daily has a fairly in-depth speculative article on this rumour, too. It sounds like a pretty sensible idea, and I think it would be well-received. Not sure exactly what form it would take, but my guess is that it would follow the concept of the past DKL games, in that it would be a reasonably close portable approximation of the current console Donkey Kong Country game - DKCR, of course, in this case. This time, I think the portable version will be much closer to its console counterpart, as the 3DS is a much more capable system than the Game Boy was. Of course, the Wii has a lot more power than the SNES, but I think the gap is considerably narrower these days. Personally, I think it's a great idea. Hopefully we can look forward to a portable Returns-esque adventure with new levels and gameplay elements... it certainly feels more likely to me than Donkey Kong Country Returns itself did, back when it was a rumour... and look what we got! 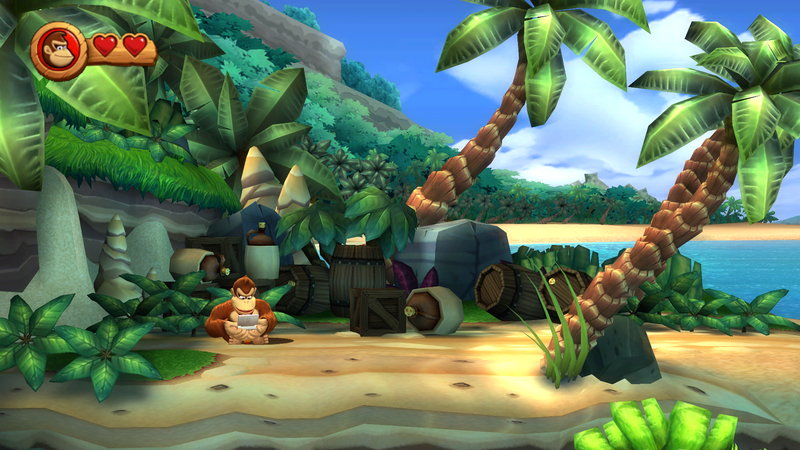 I'm feeling positive about this... seems we quite likely have another great Donkey Kong game to look forward to. Simion32 wrote: There was an image of DK holding a 3DS or something similar on the Retro site at launch day a long time ago, wasn't there? Also, DK whips out an NDS in DKCR to kill time when he's been idle for a bit, so that could be a little foreshadowing right there. Thanks for responding guys! Glad to know people are just as intrigued as I am. like previous hopes are not fully crushed. he's been absent for awhile, and very unjustly. I'm a little tired of the "Mario vs. Donkey Kong" series. So to keep this thread going, what does everyone expect/want from this rumored 3DS title? I think it will be some kind of semi-sequel to DKCR, with similar layout or something. I don't really hope anything for it, because i might never get 3DS. he's been absent for awhile, and very unjustly. I'm a little tired of the "Mario vs. Donkey Kong" series." Following the debate on DKU, I certainly wouldn't be saying it does or does not exist. Also, I didn't read the word "fake" anywhere in that article. Maybe not official, but they had to have gotten the idea to put the boxes out, from something, now didn't they? Gamestop got them in a shipment, thinking they were from Nintendo, but they weren't, so they took them down immediately... how is that not them being fake? In that article, they quote a gamestop representative. I took that as meaning the actual graphics for the case fillers were not supplied by Nintendo, which is pretty obvious in and of itself. EDIT: So what would we be looking at? Pirated games ported to 3DS? Fake cart fillers sent to stores in a scam attempt to raise speculation? EDIT2: This still smells of lies, because Nintendo won't make any comment at all. Which means there's obviously something they are afraid of commenting on. If it was a scam, they should just go out and say "we have not officially announced or shipped any such game, and the given boxes were not our doing". They used already used renders from DKCR. It's not like photoshopping that would be hard, especially since it's just words that are different. I think it was just a joke somebody played. I think Nintendo wouldn't want to comment since they might not want to close the door on the idea of a 3ds DK game. They might want one eventually, but Nintendo likes to be secretive about their game releases. Nintendo does love to deny plans for future games, even if they come to light eventually. They've had a long history of this, but who knows if we'll see a Donkey Kong game for the 3DS. It (or Pokémon, whichever comes first) would actually encourage me to get a 3DS in the first place (assuming the game is as good as the other DKC/L games), seeing that nothing else has managed to convince me so far. If this does come to light eventually (I'm not saying that it will, just saying what happens if it does), I'm curious to whether it will be a new DKL game like others have said, or a different game entirely. It would be great if it was, especially when the first three DK games that I played were for the Game Boy. It would be even more awesome if it played like Mega Man 9/10 in the sense that it would be a "fake retro" game, but I don't think a lot of people would like that for Donkey Kong for some reason. A traditional DK game would be fine for me anyway. Nintendo has just announced "Donkey Kong Country Returns 3D" for the Nintendo 3DS. A video is available on the eshop right now, go check it out! Honestly though, this is a downer for me, I was looking forward to a new "Donkey Kong Land" title. Last edited by Qyzbud on February 17th, 2013, 11:04 am, edited 1 time in total. I don't believe on this. This looks like a hoax when I see a level from DKCR in there. It looks as though someone went on Wikipedia, took a screenshot there, and edited it to fit the 3DS's resolution. Really weird. So far, though, every screenshot looks like it's from DKCR. Is this just a port? If it is, then I guess there's no point of getting it if you already have it on the Wii (like I do). Kinda disappointing, really. I hoped for a sequel. EDIT 2: I found this video, and it is indeed a port after all. Holy cow. Nintendo, have you really stooped this low? This is lazy. Don't get me wrong, I like DKCR and I think it's a great game, but I already have it on the Wii! Nintendo, if you want to convince people to get a 3DS, make new games -- don't make completely unchanged ports of existing ones. I'm not buying the same game twice. Ironically, people constantly criticize the DKL games (mainly 2) for being ports of the SNES games, but that wasn't really the case until now. The DKL games had new things to offer (for example, the unique levels in DKL and the Time Attack in DKL3, and the new layouts in DKL2 were refreshing enough), but this DKCR port doesn't seem to be changed one bit. I guess everybody who criticizes DKL for being ports has something new to criticize. It's sad that the 3DS has been out for close to two years now, and it has virtually nothing to offer except for Pokémon X/Y, pretty much. I don't think Nintendo is going to last forever, I really don't. EDIT: Darn, I wasted my 200th post on this?! Yes, Mario Wiki confirmed it, this is real. huge shame, while Mario And Luigi got a sequel this is just a silly port, massive shame. Nothing new. I know. There is absolutely NO excuse for not doing Donkey Kong Land Returns instead. I think they should of done a Donkey Kong Country Returns 2 on Wii U, with new levels, kremlings, more animal friends, etc., but why a port of the 1st Donkey Kong Country Returns on 3DS? You here me Retro Studios? Make DKCR2 on Wii U! At the very least, hopefully there will be a healthy dose of new content/challenges in this 3DS port to sweeten the deal for us DKCR fans. *I would love a DKC2 Returns... not just a sequel to DKCR, but one with a strong emphasis on bringing back Diddy's Kong Quest. Weren't there some game cases earlier that Scraps69 found in some local gaming store? Well I guess this confirms that those unfinal-box-arts were there for a reason. While it is a downer this is just a port, I still have faith Nintendo won't drop DK anytime soon, especially since we just got him back from his long slumber. And to those currently bashing the 3DS' library you obviously haven't been in touch with the system , there's a great article on Kotaku explaining why it's (in the writer's opinion) the best console for 2013. I've had mine since launch day, and I've never regretted the purchase, especially with what's on the way for this year. Anyway, I feel honored to have started the official topic on the main page, thanks guys! Before the merge, TWC wrote: Looks like the prediction was right...mostly. Last edited by Qyzbud on February 24th, 2013, 11:54 am, edited 1 time in total. I know a lot of people complained about the motion controls for the Wii being forced on you for this game. I played a friend's DKCR and I really didn't like the controls. I think with it being on the 3DS, it could be much closer to the original. So, it would at least play a bit more like the SNES ones. I think I might buy this game, even though I already have Returns on the Wii. While I can understand where people would prefer button controls, I wouldn't buy the game again just for that. And while motion controls certainly can take me time getting used to, so did the analog stick back in the N64 days (for me), yet nobody else seems to complain about that. In short, in this mode, the Kongs get 3 hits instead of 2, and can use new items, ranging from one that saves the Kongs from falls, another that allows mine carts and rocket barrels to take a second hit, and another that is basically a DK Barrel in reserve. ...it's hard for me to see that these changes will not make it too easy. Glad to hear DKCR3D gets some now contect. I wonder what puzzle pieces (jiggles?) do in this port. Hey, maybe Qyz or a mod could just change the name of this topic to "Donkey Kong Country Returns 3D"? I'm planning on making a more detailed post here soon but I keep skimming over the topic. Just a suggestion. Sorry to necro, but should there be a subforum for this? Since there's subforums for the GBA ports and DKL, I was surprised to see there wasn't one for DKCR3D. Nah, it's essentially just a port of the Wii game. So, I was looking at a DKCR3D display box (it had the manuals and a plastic card with a label on it to look like the game) and there was a DKCTF advert. It was nothing special, just a coming soon thing. It also said to buy DKCR3D to give players an new handheld adventure while we wait, and mentioned 'a new perspective on new levels'. Since I don't own the game, does anyone know if the new levels literally meant new levels? Bump, but to answer your question. There are a few new levels, but I think you have to beat the original Wii levels first to get to them. And by a few I REALLY MEAN ONLY A FEW. And I have no idea what they're going on about a "new adventure", unless they're talking about Tropical Freeze. MrsQyzbud wrote: Frick on a stick! "...Once you make it out of the tunnel segment, avoid the falling crystal rocks and grab the G high in the air between two of them. Fly through the narrow path between the rocks ahead until your rocket finally runs out of fuel. Upon landing, go right to find a boarded up doorway. Ground pound in front of it to get Puzzle Piece #5. With that done, jump into the Goal Barrel and get out of here." CatLoverMolly wrote: Sorry to necro, but should there be a subforum for this? Since there's subforums for the GBA ports and DKL, I was surprised to see there wasn't one for DKCR3D. Simion32 wrote: Nah, it's essentially just a port of the Wii game. You know, CatLoverMolly, initially I felt the same way as Simion... but in all fairness, the 3DS release does add a bunch of new levels (a whole world of them), in addition to an (arguably) improved control setup, new gameplay options, etc. — basically, a lot of differences worth discussing that could get confusing if there's no distinction between the two versions. What does everyone think? Shall I make a subforum for this excellent port? I think that's a great idea! Good suggestion. I mean, honestly, this is Donkey Kong Country atlas, and DKC Returns 3DS is an official Sequel.